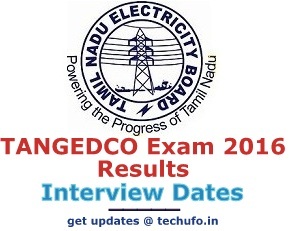 TANGEDCO Assistant Result 2016-2017, Tamil Nadu TNEB Typist Exam Results, Cut off Marks and Jr Auditor Merit List released online at www.tangedco.gov.in official website. We have the latest update on TNEB TANGEDCO Result 2016-17 of written exam held on 19th June, 27th August, and 28th August. As per the report, the Tamil Nadu Generation & Distribution Corporation Limited will announce TANGEDCO Assistant Result 2016-2017 very soon by publishing on their official site. A humongous amount of candidates has applied to this direct recruitment and successfully given TANGEDCO Competitive Written Examinations on particular dates as per revised schedule. Now, after the examination, all the candidates are energetically searching for TNEB typist exam results and cut off marks at the main portal. Contestants who are eagerly waiting for Tamil Nadu GEDCO Asst Merit list 2016 can visit the primary site. Every candidate is hereby informed that their result will be updated soon to the official website. If applicants want to predict their status for further selection phase then check out TANGEDCO Assistant Cut off Marks from a quick link given below. For more important information about TNEB Assistant result release date, kindly read out the whole article. Check your Written Exam Marks Now!! Tamil Nadu Generation & Distribution Corporation has published marks of the written examination held on 19/06/2016, 27/08/2016 & 28/08/2016. Candidates will get their marks through a link uploaded below. The Cut off marks for all posts has published accept Junior Assistant/Administration and Account Posts. Cutoffs for Jr Assistant (Accounts & Administration) not published, since the case is pending before the Hon’ble High Court of Madras. Candidates can check Cutoff Marks and download their Interview Call Letter from the official link (tangedcodirectrecruitment.in) attached below. Keep visiting this page for the further updates. About Tamil Nadu Generation & Distribution Corporation Limited: It is an electrical power generation and distribution public section undertaking company of the TN state. It is totally owned by the Government of Tamil Nadu. This company is a subsidiary of TNEB limited. It was established in the year 2010 on 01st November under section 131 of the Electricity Act 2003. The head office of this organization is situated in Chennai. Their main service is electricity distribution and product is electric power. The main responsibility of this department is to generate, distribute & transit power supply throughout the state. On 31st March 2015, the total number of consumers being served by this department is around 264.67 Lakhs. It has also proposed to establish small hydroelectric projects of capacity less than 25 MW. The company’s new projects are Uppur Thermal Power Project, NCTPS Stage III Thermal Power Project, North Chennai Thermal Power Station Stage and Tuticorin Thermal Power Station. TNEB releases employment news paper every year for filling up vacant posts in its different departments. It also hosts recruitment examination for the applied aspirants. 1.3 How to check online TNEB TANGEDCO Assistant Exam Results 2016-2017? The TANGEDCO Recruitment released for 2175 vacancies of various posts like typist, steno typist, jr. auditor, asst draughtsman, field assistant, tester chemical, junior assistant (accounts & administrative), and technical assistant jobs. This employment notification was published just four-five months back on 29th Feb 2016 with a purpose to recruit most eligible people. Interested candidates who were looking for latest govt jobs in Tamil Nadu state had utilized this golden opportunity by applying application before a due date. As per the official notification, this examination was purposed to schedule in the month of April but due to the state election they had postponed exam to the month of June and August. Now recently on June 19, the board has conducted written exam for those who applied for the asst draughtsman, typist and junior auditor posts. The board has also organized written test on August 27 for posts like field asst., tester chemical, steno-typist and junior asst (accounts). The examination for junior assistant (administrative) and technical assistant (electrical & mechanical) was held on August 28. All these competitive written examinations were conducted at 08 Regional centers namely Chennai, Coimbatore, Vellore, Villupuram, Erode, Tiruchirapalli, Madurai, and Tirunelveli. The Tamil Nadu Electricity Board has successfully completed the first round of selection process i.e. written exam of 100 marks in three parts. Now, candidates are eagerly waiting for the results of TANGEDCO exam so they can know their final rank. Contestants who clear this test will be invited for further selection stages such as Practical Test, Trade Test, Typing Test, Computer Test, Personal Interview, Group Discussion, Document Verification, etc. Only those applicants who qualify in written test by being ranked high will be eligible for next round as per reservation rules of 1:5 ratios. Now let me inform all the candidates that Tamil Nadu GEDCO results 2016 of 19th June exam will be published in a short time at the official website. After declaration, aspirants can download their results from the primary portal by using Registration Number and Roll Number. The TANGEDCO result of 27th & 28th August exam is expected to release in the month of October. We will inform applicants through this web page as soon as TNEB released the results of respective posts. We have given a TANGEDCO Assistant Merit List download link here in this article for the sake of contestants. We have also listed some simple and easy points to check out TNEB TANGEDCO Assistant Exam 2016 Result from the official online portal. The marks of the Competitive Examination release for Assistant Draughtsman, Junior Assistant/Administration, Junior Assistant/Accounts, Junior Auditor, Tester Chemical, Typist and Steno typist posts. The candidates may view their marks of written examination through a link attached below. The candidates may use their user name (i.e mobile No.) & Registration Number to generate result. The board has proposed to conduct the interview after 19th of November 2016. The selected candidates will get interview date, venue and time subsequently via online sources. After the interview, the selection will be made based on the 85% marks of written examination and 15% marks of interview (10% marks based on the performance in the interview and 5% for Academic marks). The board has also released written examination marks of 525 (500 Electrical + 25 Mechanical) Technical Assistants and 900 Field Assistants after vacating stay orders from Hon’ble High Court of Madras. How to check online TNEB TANGEDCO Assistant Exam Results 2016-2017? Open the official website or click on a quick link provided below. Now, search a download link titled as “TANGEDCO Recruitment Results for Notification 01/2016 & 02/2016” in “Latest News” section. Click on a relevant link specified above soon after you got it from the home page. Insert your Application/ Registration Number, Roll Number, Date of Birth, Password, etc. in a newly opened login page. Re-check entered digits and then submit it. A pdf file will open on your active screen soon after a valid submission. In the merit list, the names and roll numbers of qualified candidates will be mentioned. Check out your roll number is there in a merit list or not. Download and save the result pdf file to your computer or mobile. If possible then don’t forget to take two printouts for further reference. Those who have any queries about the Competitive Examination marks can contact land line numbers 044-22358311 and 044-22358312 between 10.30 AM to 05.30 PM. Our www.techufo.in team wishes ALL THE BEST to every candidate who had attempted this examination. Contestants can bookmark this article for upcoming updates on Tamil Nadu Electricity Board results and final merit list. Follow our site for regular alerts on latest govt recruitments, rojgar samachar, railway jobs, banking jobs and much more. In a below comment box, applicants can share their query or doubt with us by just submitting in it. We will do our best to reply as soon as possible by finding a perfect solution, THANK YOU. when ja admin selection roaster will come? I have sufficient mark in selection cutoff list so my job s conform. When will you publish the selection list as per roaster. Pls reply me. add me admin group..am alredy in this group..my mbl was some prblm..so am exist in this group..pls add me..
pl when ll release the oppointment order, i would like to know please share anyone the correct details. Pl Sir I am waiting for interview date in typist pl add me . Pl sir typist interview date pl add me. Pl sir typist interview date sollunga pl I am waiting . Add myself to tneb junior assistant accounts group 965936763.. Whether govt order issued for junior assistant (admin & accounts) 2016 batch Tangedco.